Carrying out expert work without the dealership prices, the team at Bromley Car Repairs possess specialist knowledge of the world’s leading car manufacturers. Using genuine parts, you can be confident that any work your car receives will be carried out to the highest quality possible. Take a look below to find out more. We are experts in Volkswagen, Audi, Seat, Skoda, BMW, and Mini and can provide everything for your vehicle servicing needs, including bodywork repair, brake checks, tyre replacement and clutch repair. Whether you need a Volkswagen garage for a service or a clutch replacing on an Audi, why not give the team at Bromley Car Repairs a try. Our professional team are experts when carrying out MOT's in Bromley. You can trust your vehicle will be left in safe hands at Bromley Car Repairs and that you will be kept fully updated on its progress. We are trusted members of the good garage scheme and our customers have given our services a 5* rating. We work hard to maintain our high standards every day. If you are searching for a car repairs garage in Bromley, we are conveniently located on the A21, Masons Hill; a short 10 minute walk to Bromley South train station. Servicing doesn’t need to be carried out by a main dealer, and therefore doesn’t have to be costly. We are experienced in servicing all makes and model of vehicle but are proud to be Volkswagen, Audi, Seat, Skoda, and Mini specialists, so where applicable, your vehicle warranty will be maintained and all servicing will be carried out to the specifications set out by the manufacturer. Our customers have given us a 5 star rating via the Good Garage Scheme. Huge savings! Our Labour rate averages 50% less than a main dealer. Free collection & Delivery Service if required. Free gold standard mini valet with every full service. 10 minute walk to Bromley Town centre & Bromley South station, or will drop you off. Original equipment parts used, which come with a 2 year or 20,000 mile guarantee. Service Logs / History maintained. Voted Business of the Year by Best of Bromley. To ensure that your car receives the greatest care possible, Bromley Car Repairs carries out all maintenance and servicing using authentic manufacturer parts. By fitting parts that are issued by the original equipment manufacturer (OEM), our repairs are completed to the same standard you’d expect from a dealership. However, as an independent garage, we’re up to 50% cheaper than the main dealers. You don’t have to rely on a Skoda main dealer to ensure you get the very best servicing, parts and repairs for your vehicle. Bromley Car Repairs can carry out all essential repair work and maintenance to our usual high standard for a fraction of the cost. Bromley Car Repairs offer servicing and maintenance for your Mini, carrying out each to the highest standards. We use genuine Mini parts and our fully trained staff will ensure that your vehicle is given the care and attention it deserves. As official Audi servicing agents, we use original Audi parts when repairing or maintaining your vehicle. Our outstanding and honest service will ensure that your vehicle leaves our garage in Bromley meeting your expectations and without the big bills of a main dealer. We offer servicing, repairs and maintenance for all vehicles within the VAG family. Our staff are professionally trained and can attend to the work required on your Volkswagen with ease. You can relax knowing your vehicle will be fitted with original parts and expertly maintained without the hefty main dealer price tag. We can provide servicing and vehicle repairs to any model of Seat car. Our professional team will ensure that your vehicle is looked after and that you are kept up to date of any repair work that is required. 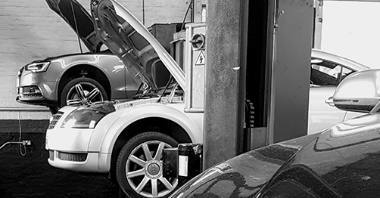 We also offer professional Seat car servicing from our MOT Centre in Bromley. If your BMW needs a bodywork repair or you are experiencing a mechanical or technical issue, then we can help from our Bromley Garage. Our staff have expert knowledge in BMW maintenance and general repair work, and we use only genuine BMW parts in the work we carry out.